What happens when charades meets craft supplies? Morphology for adults and Morphology Jr. for kids. Do you think you have what it takes to silently build a word out of objects before time runs out? Are you able to guess what someone else creates? Not to mention the additional challenges that are applied with each roll. Morphology was voted #2 on Times’ top ten list of toys of the year. It also made the 2012 Teachers’ Choice Awards for the Family by Learning® Magazine. Want to learn more? 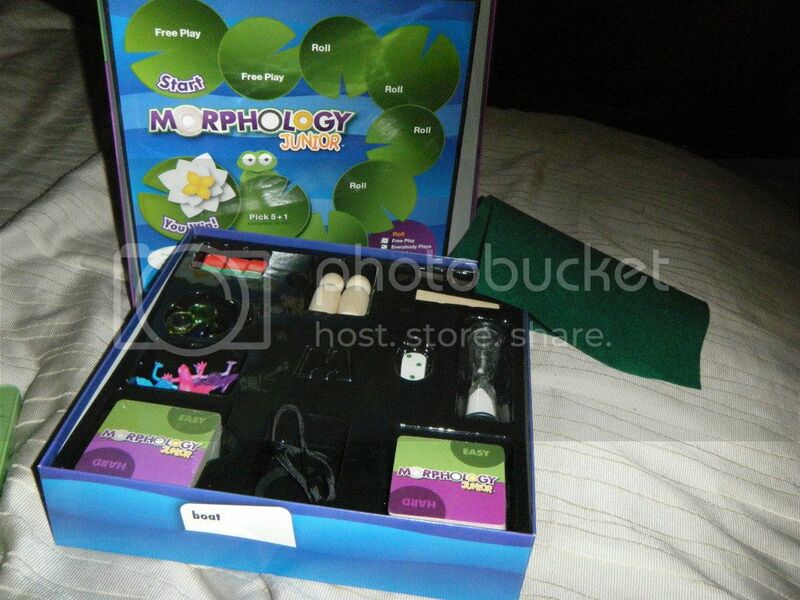 Visit Mommy Lesson Plans to read her Morphology Jr. review and find out what the hypes all about. This event would not become possible without the participation of these amazing co-hosts: Giveaway Gator , Couponing with Integrity, and Pea of Sweetness.a Rafflecopter giveawayThis giveaway is open to entrant 18 years of age or older, except where prohibited by law. US residents only. No purchase is necessary to enter. The odds of winning are based on the number of entries received. To qualify to win, you must complete, at minimum, one entry on the Rafflecopter form. The winner will be randomly chosen by Rafflecopter. Winners will be notified by email from Mommy Lesson Plans. Winners will have 72 hours to respond or risk forfeiting their prize. Prize may re-awarded solely by the Sponsor’s discretion. Prize fulfillment is the sole responsibility of the sponsor. This blog may not be held liable for Sponsors who do not fulfill prize shipments. Mommy Lesson Plans was not compensated for this post. I reserve the right to publicly publish winners’ names. By entering this giveaway, you are agreeing to these terms and conditions.